This interactive presentation contains the latest oil & gas production data from 83,177 horizontal wells in 10 US states, through December last year. Cumulative oil and gas production from these wells reached 8.0 Gbo and 84.2 Tcf. After two years of falling output, oil production grew by over 1 million barrels of oil per day in 2017. The Permian basin was responsible for more than half of this growth. Gas production grew at very similar rate (excluding West Virginia, which has not yet reported 2017 production numbers), to over 46 Bcf/d (switch ‘Product’ to ‘gas’ to see this). In the ‘Well quality’ tab production profiles for all these wells (oily basins are preselected) are plotted, with wells grouped by the year in which production started. On average, wells that started in 2017 had a peak rate of almost 600 bo/d in their first full calendar month on production, compared with ~420 bo/d for wells that started 2 years earlier. The last overview (‘Top operators’) shows the 5 largest oil & gas operators in these states, based on operated production from horizontal wells. EOG, far in the lead, is now nearing half a million barrels of oil per day production. If you click on its name in the legend, you will see in the map below that this operator is active in all unconventional oil plays. The trend of improving well productivity over the years is clearly visible here. Still, some of the best well results (for oil) were obtained in the Bakken in 2008/2009. If for example you select only ‘EOG’ (using the ‘Operator’ selection) and include those years (with the ‘Year of first flow’ selection), you will see that these early wells for this operator, which are Bakken only, appear on a path to roughly double the oil recovery than more recent wells. [Update] There is some delay on the planned ‘Projections’ post due to a bug in an external tool that we use. I currently aim to have the new post up tomorrow or on Monday. I still think everybody is missing the bigger picture of oil. Let me give you example. Prudhoe Bay hit 1.5 million barrels a day in 1980, and there was only 200 wells producing to produce 1.5 million barrels a day. Now lets fast forward 30 years and look at the Permian Basin. This is just the unconventional part of the Permian. 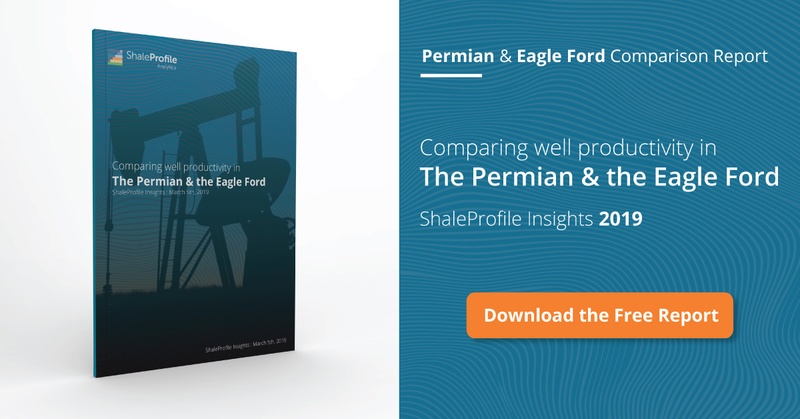 The Permian Basin hit 1.5 million barrels a day from unconventional wells sometime in 2017. However, it took somewhere around 12,000 wells to get to that 1.5 million barrels a day. That is the difference between unconventional and conventional oil. 12,000 wells time 8 million a well is 96 billion in capital to hit 1.5 million barrels per day. 200 wells in 1980 maybe 2 billion was spent on Prudhoe Bay. Also oil in inflated dollars would be worth 107 or so dollars today, and here we are today at 65 WTI. This should so how much capital it will take to meet the EIA numbers. Thank you Enno, for the hard work. I am particularly interested in looking at the 2014 and earlier shale oil production for the USA. At the end of 2014 production was approx. 4 M bbls/day. Now that the 2017 numbers are in we can see clearly that the 2014 and earlier production declined from 4 M bbls/day to just over 1 M bbls/day in only 3 years. This is more evidence that shale oil is like a mining operation. Stop mining and your production goes to down hill fast. I guess my point is the Saudi’s really don’t have a lot to fear. If the banks get tired of this game, Shale oil will disappear fast. With around 7,000 new horizontal wells drilled during 2017, the industry is adding ~20 wells a day. This translates to $120-150MM/day Capex. Producing almost 5 million bopd at net $50/bbl is equivalent to $250MM/day of oil sales revenue. There are “geological” limitations to core areas in America’s shale basins. I estimate, conservatively, to plug, decommission and restore the surface around America’s 83,000 shale oil wells: $11-13B depending on future NORM regulations. At $60 gross oil, net back’s in the three largest shale basins range from $27-32 per BO after all costs are deducted, including royalty, taxes, G&A, interest expense and ever increasing OPEX; the shale oil industry is still outspending revenue. Then, of course, there is the matter of approximately $240B of “public” shale oil debt and an unknown amount of private debt (upstream only) that must, at some point, be paid back. At $30 net back prices folks can decide for themselves how many BO must be produced in the future just to get out of existing debt, just to get back to even. I agree, Drilling Guy; in fact I believe OPEC is well aware of unconventional shale oil decline, its unprofitability, its massive debt, and with $65 dollar oil it is giving the US shale oil industry just enough rope to hang itself, to drill itself plum out of business. The faster the better, from its standpoint. Unfortunately the people that are in charge of our nations energy future are dazed by the false premise of shale abundance and cannot think much past next week. Checked off 5 of 7 so far. PS: take a look at google maps/earth of the Permian Basin area. Pin cushioned with wells and overlaid with Oil/Gas infrastructure. And people call the Oil Sands up here in Canada an environmental nightmare. I think with the Permian growth rate lately, we have more than a viable contender for top spot now. Thanks. Enno, all respect for your intensive work. I think it gives the best perspective possible on the domain. Still, I’m puzzled by some possible inadvertence. You mention cumulative production of 8.0 Gbo from more than 83000 wells, a little less than 100 Kbo cumulative production per well. These numbers are clearly consistent with the Total Production graph. By the way, I checked more than 78000 wells from 2010 on up to last December , on your interactive graph, and more than 74000 wells still in production. But, on your Ultimate Recovery Profiles graph, I see average cumulative production of at least 130Kb (except 2017) and a total of wells of only 54000 (including 2017) out of all 78000 wells. These selected wells are clearly better than average, so that the ultimate recovery per well may be misleading. 47131 wells , so that the other 22000 wells, not included with these years, remain with a cumulative production of under 1.44Gbo (excluding 0.4Gbo for 2017 wells from 8.0Gbo total cumulative, we remain with total cumulative of less than 7.6Gbo). and average of less than 65Kbo cumulative production ( 1.44Gbo / 22000wells) for wells excluded. All the wells drilled before 2010 were not included in my computations here, and their production was considered negligible. Thank you for your feedback and comment Alex. > But, on your Ultimate Recovery Profiles graph, I see average cumulative production of at least 130Kb (except 2017) and a total of wells of only 54000 (including 2017) out of all 78000 wells. The reason for this apparent discrepancy is that in some of the dashboards I filter certain basins, for different reasons. For example, in the ‘Total production’ overview, if you look at the ‘basin’ selection below the graph, you can see that West Virginia is not selected. The reason is that it only has production reported through the end of 2016, and including it would cause an unintuitive drop in 2017 especially when you look at natural gas production. In the ‘Ultimate recovery’ overview, I only selected the basins that are somewhat more oil focused. I did that because if you include the gas basins here, it is no longer possible to say something about the trends that you are seeing, as they just may be caused by shifting activity between gas & oil basins. That explains why you see a higher than average oil production here. If you change the ‘basin’ selection in this dashboard to include all basins here, you can see that the average production drops below 100 kbo, consistent with the totals I reported in the beginning of the post. I recommend to play a bit with all the options and filters in these dashboards, and to look at the tooltips on the graphs which give more information about e.g. the number of wells included. Just let me know if you got any more questions!